Coach Chris offers monthly Run Coaching. He has athletes who compete in all distances. He's a coach who has trained Run/Walkers to their first 5k and seasoned 50+ to their best races. 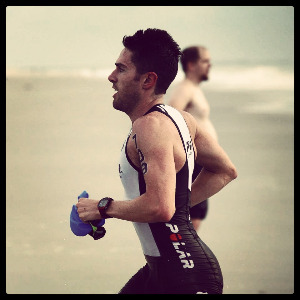 Coach Chris focuses on the recovery of the individual athlete and ensures proper cycles within training blocks. Bragging Rights: Coach Chris began his competitive running career in 2010 and was never a collegiate runner. Coach Macca has the philosophy of value over volume. He is versed highly in Running Biomechanics. He has experience with group cycling and bike handling skills. He is a certified Level 1 Coach with USA Track & Field, Personal Trainer with ISSA, Spinning Instructor, Myofascial Compression Technique Instructor through TriggerPoint Therapy, Newton Good Form Running Coach, and earned his BA in Sport Management from St. Leo University. He is currently a Polar Heart Rate Ambassador since 2013, HumaGel Ambassador, and Saucony footwear Ambassador for 2015. He has over 23 overall victories out of 75 races in the past 4 years and countless top 3, top 5, top 10 finishes and age group wins. He has been training athletes for the past 6 years. His athletes become more efficient through the use of his individualized training sessions incorporating speed, pace, distance, or heart rate to stimulate adaptations and supercompensations to assist the athlete to meet and exceed their goals gradually. He also teaches his athletes the uses and benefits of self-myofascial release, nutrition, hydration, and proper recovery. I am looking for athletes who are looking to compete in running races and triathlons. Ideally half marathons around or under 2 hours. In triathlons, be able to sustain 15+ mph on bike. Success. Coach Christopher McCaffrey has been notified of your message.